This data set consists of roads, drainage, railroads, utilities, and population center information in readily usable vector format for the land area of the Former Soviet Union (FSU). The reason for offering this data set was to create a completely intact vector layer that could readily be used to aid in mapping efforts for the area of the FSU. The five vector data layers were assembled from the Digital Chart of the World (DCW 1993). Individual record attributes were stored for population centers only. Vector maps for the FSU are in ArcView shapefile format. A graphic map using all of the DCW data for a selected area is included with the data set (see Figure 1). Figure 1. 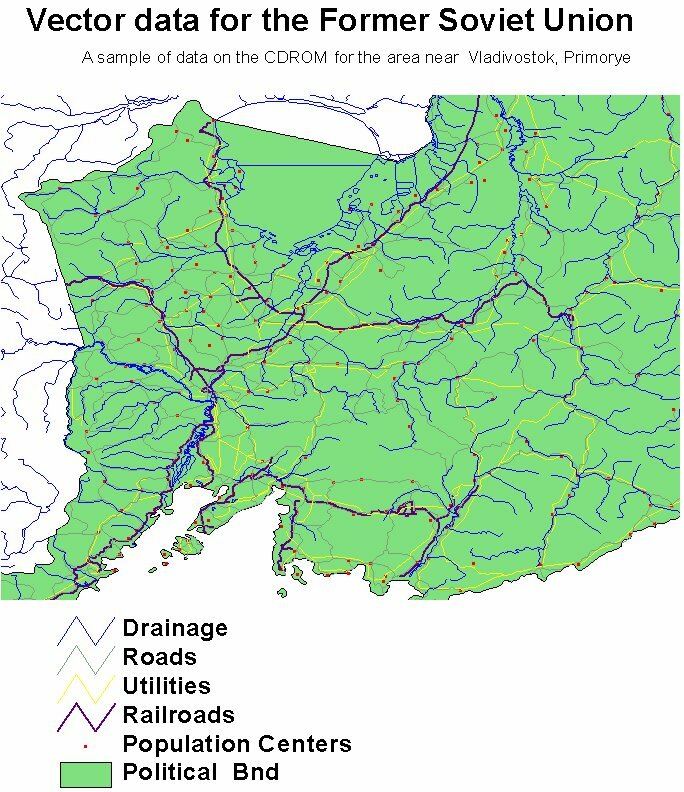 Selected infrastructure vector data near Vladivostok, Primorye, Russia. Stone, T. A., and P. Schlesinger. 2003. RLC Selected Infrastructure Data for the Former Soviet Union, 1993. Data set. Available on-line [http://www.daac.ornl.gov] from Oak Ridge National Laboratory Distributed Active Archive Center, Oak Ridge, Tennessee, U.S.A. doi:10.3334/ORNLDAAC/698. Five vector data layers from the DCW are assembled here, including roads, drainage, railroads, utilities, and population centers. Individual record attributes were stored for population centers only. See other Russian Land Cover data sets. The entire land area of the FSU, in decimal degrees of latitude and longitude. Spatial resolution is 1:1 million in Geographic projection. The web site of the map room of the Pennsylvania State University Library used the 1993 version of the the Digital Chart of the World at 1:1,000,000 scale. Population center Population Unitless Not Applicable Not Applicable. Roads Road networks Unitless Not Applicable. Not Applicable. Railroads Map of railroads Unitless Not Applicable. Not Applicable. Utilities Map of utilities Unitless Not Applicable. Not Applicable. Vector map of drainage networks for the FSU in ArcView shapefile format (compressed). Contains three files: allfsudn.shp, allfsudn.shx, and allfsudn.dbf. Vector (points) map of population centers for the FSU in ArcView shapefile format (compressed). Contains three files: allfsupp.shp, allfsupp.shx, and allfsupp.dbf. Vector map of road networks for the FSU in ArcView shapefile format (compressed). Contains three files: allfsurd.shp, allfsurd.shx, and allfsurd.dbf. Vector map of railroads for the FSU in ArcView shapefile format (compressed). Contains three files: allfsurr.shp, allfsurr.shx, and allfsurr.dbf. Vector map of utilities for the FSU in ArcView shapefile format (compressed). Contains three files: allfsuut.shp, allfsuut.shx, and allfsuut.dbf. The reason for generating this data set was to create a completely intact vector layer that could readily be used to aid in mapping efforts for the area of the FSU. The source data were acquired from the DCW Server, Pennsylvania State University Libraries. See World Wide Web address: http://www.maproom.psu.edu/dcw/. Source vector data were ingested into Arc Info and reprojected as needed to Geographic coordinates. Coverages of common themes were appended together and topologically cleaned, and the tile borders were dissolved to form single coverages. The resulting shapefiles were exported from these ArcInfo coverages. Attributes were not stored for roads, utilities, railroads, and drainage. This data set is available from the Oak Ridge National Laboratory (ORNL) Distributed Active Archive Center (DAAC). Data can be obtained electronically on the ORNL DAAC's anonymous FTP site or from the DAAC's search and order system. Data files are also available by request from uso@daac.ornl.gov . The web site of the Pennsylvania State University Library map room uses the 1993 version of the the DCW 1:1,000,000 scale. The source data are described there as an Environmental Systems Research Institute (ESRI), Inc., product originally developed for the U.S. Defense Mapping Agency. See http://www.maproom.psu.edu/dcw/dcw_about.shtml for more information.